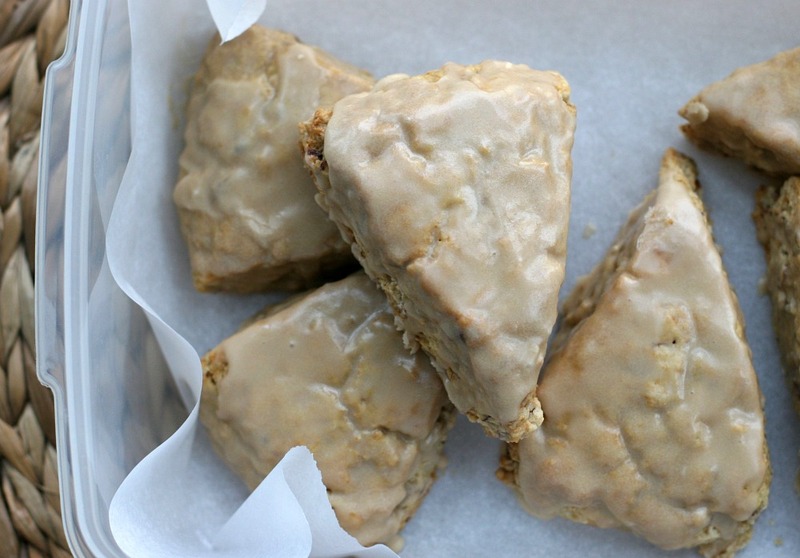 Starbucks maple oat scones were my morning bit of bliss for a couple years. When I worked at eBay we conveniently had a Starbucks located across the parking lot. I would buy my grande coffee and wait eagerly to receive my maple scone. When I travel and find myself someplace new, I eventually end up in a Starbucks and always try the maple oat scone. Each region seems to have a slightly different recipe in use so it’s fun to see the variation. I’d heard rumors that the scones had been discontinued but I still occasionally see them. With my recipe though, you won’t need to wait in line and can save money. I’ve always thought that ‘some day’ I’ll work on figuring out the recipe. Every time I make scones, I ponder how I might concoct the recipe. Yesterday, while busy with a bunch of little projects, I decided to spare an hour to crank these out. But, how do they taste? I think they taste just like the real thing, maybe better since mine haven’t sat around in a freezer. My scone recipe is is adaptable for so many flavorings and knew it would work for this challenge. I would use oatmeal, half ground finely into flour and the other half coarsely ground for texture. I would then add pecans, brown sugar, and maple syrup. The scones baked beautifully and contain more liquid than I usually would add, so I baked for a bit longer. I could barely wait to dive in once the scones came out of the oven. In a large bowl, combine the scone dry ingredients. Using a pastry blender, cut the butter in until pieces are smaller than the size of peas. Stir in the chopped pecans. In a small bowl, stir together the cream, egg, and maple syrup. Add this to the dry ingredients and mix until just combined. It is important that you do not over mix the mixture. Once the liquid is absorbed and the dough is coming together (only a little dry flour in bottom of bowl), then stop. Remove dough from bowl and knead until it holds together. Pat the dough in to a 7″ circle that is 1 1/2″ thick and cut into 8 wedges. Use a spatula to carefully place scones onto a greased cookie sheet (I lined mine with parchment). Brush tops and sides with egg wash. Bake at 375F (190C) for 20 minutes. While the scones bake, mix together the maple glaze ingredients in a small bowl. 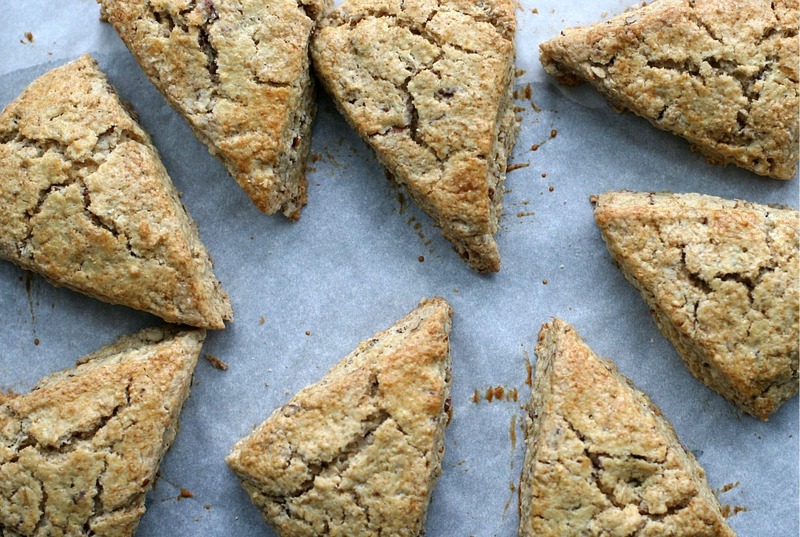 After baking, allow scones to cool on baking sheet. The scones should be completely cooled before attempting to glaze. Pour 1 tablespoon glaze on top of each scone, using the back of the tablespoon to spread it evenly over the top and down the sides. I was so excited that I didn’t wait long enough before glazing and the glaze slowly melted into the first few scones. So, I stopped and patiently waited (well, somewhat patiently). The scones are moist and delicious. I am thrilled with the outcome! I don’t think there’s much, if anything, I’d change next time. I used to get Starbucks scones all of the time, but now I haven’t had one in a few years. Probably a good thing! I’ll have to try your recipe. 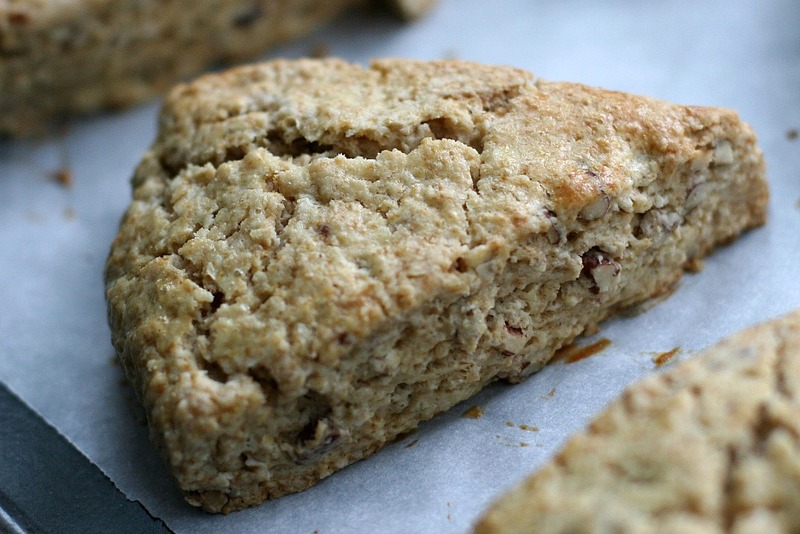 These scones were my family’s favorite when I was growing up! I am definitely going to make a batch. Thanks for sharing the recipe! These sound amazing! I like the different oat textures. Will definitely try. They look fantastic! I’ve never tried the ones at Starbucks, but I can definitely see myself making these! p.s. I really love that last photo!! I was googling something and came across this by accident..and now I think I might be in love with you! I used to eat the Starbucks Maple scone at every visit…and then they disappeared…never to be seen again. NOW, I can make them myself!!! Thanks to you! Glad to see I’m not the only one who loved the Starbucks maple oat scones! I ate two yesterday … hmmm, maybe three. I don’t recommend eating so many in one day but they were so hard to resist. Never thought I would actually say this, but I am tempted by a Starbucks product here! (my neighbor and a friend work at the company and I found out their pastries are frozen ) This is a scone I would enjoy, thanks! Oh, how good! Now will you recreate the cinnamon scones they used to sell with the big chunks on cinnamon in them for me?! What a great recipe. The best part about this recipe is that its so easy to change up the flavor combination’s and be just as magnificent as the original, but suited to meat your likes. Great job guys, keep them coming. Wait…how do you grind the oatmeal? I love the look of these but I am afraid of having to grind oatmeal!? Can I find it in a specialty store? Don’t be scared ;-) You can grind oatmeal in a food processor or coffee grinder (just make sure to wipe it out first). It will grind up in a matter of seconds. I have one of those stick blenders that has a small food processing attachment and works great for processing small amounts like this. If you don’t have any of this equipment, then I would suggest using oat flour in place of the finely ground oats and instant/quick-cooking oatmeal in place of the coarsely ground oatmeal. The oat flour will blend in to the mix and give an oat-y flavor and the coarsely ground oatmeal adds some texture. Hi, I was browsing for ranginak recipe and came to your beautiful website. I have a question about the recipe- it calls for cooking the flour and butter together and pouring 1/3rd, arrange dates, add the rest of the flour mixture. Now the sugar is added on the top- so the flour mixture is not sweetened in any way? Thanks for visiting my site! The Ranginak recipe only uses the sugar in the topping, it is not mixed into the flour. I haven’t made this in awhile and now you having me thinking about it again. It’s such an interesting and delicious treat! 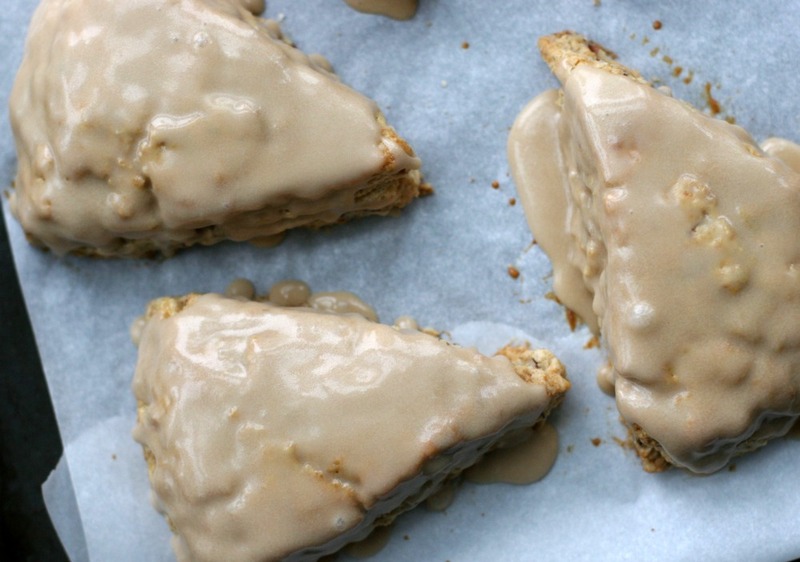 I love anything with maple and I have yet to make scones. I think I’ve just found the recipe I’m going to try this week. Looks fantastic!